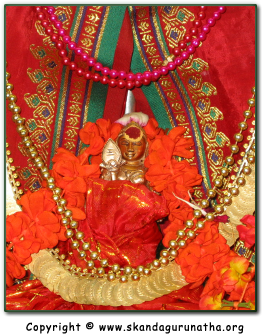 Darshan - Temple: Call and I am there, instantly! Last night, I had a vision that I was in my dormatory and was frightened. I don't know why I was frightened but I just was. Doors slamming, people yelling, unknown footsteps. I don't know why I heard these things, but for some reason, I became frightened. I immediately closed my eyes and yelled,"Muruga! Amma!" Suddenly, as I opened my eyes, I was not in my dormatory anymore. I was in a temple. There were a few devotees on my left and on my right side. I recognized Siva-Anna. He and the other devotees, began to prostrate on the ground. When I looked ahead at to see what they were prostrating at, I saw a beautiful vigraham of Thiruchendur Murugan. 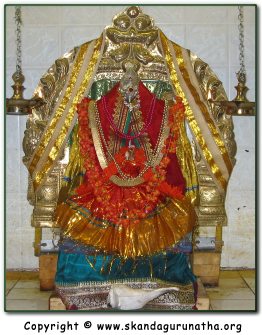 It was of a golden vigraham (similar to the vigraham seen in the Toronto temple) and there was a pancha-aarathi lamp with the camphor lit. It was placed in front of Sri Murugan and upon seeing His beautiful form and Vel, I, too, prostrated. And when I did, I awoke. I don't know what trouble I was in, nor does it matter. The significance of this experience to me was to show how instantly my mother and father God (Bhagavan Sri Skanda) responds to the call of His child.